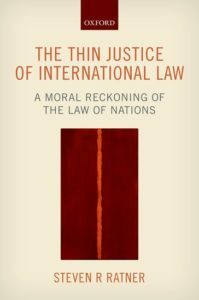 This essay is part of an online book symposium on Steven Ratner’s The Thin Justice of International Law, organized together with EJIL: Talk!, the blog of the European Journal of International Law. The book will be discussed over the course of the week by Kristen Hessler and David Lefkowitz, who will be joined over at EJIL by Anne Peters, Rob Howse, Jean d’Aspremont and Frédéric Mégret. To read the other contributions, visit EJIL: Talk!. I begin with thanks to the editors of the two sites that have organized this mini-symposium and to the five authors, from ethics and international law, who have agreed to comment on my book. I hope this experiment in interdisciplinary blogging will be the start of something bigger. The project that eventually became The Thin Justice of International Law began out of a sense of frustration that two of the core disciplines central to developing ideas and norms of global justice —philosophical ethics and international law—were not engaging with each other. Political and moral philosophy can give us the carefully worked out ideas for improving the existing world order. Yet much of it lacks institutional awareness. In particular, I saw a dominant trend among philosophers to dismiss existing rules of international law as lacking in moral stature, as if their origin in power politics or compromise meant they could not have any independent moral grounding; or simply to ignore legal rules and institutions in their theorizing about global justice. International law, for its part, represents a real-world set of rules and processes for a kind of world order, but too many of its practitioners downplay ethical questions as ultra vires or engage in undertheorized attempts to bring certain moral sensibilities into their work. (Certainly, some legal fields focus on justice quite directly, but it runs against the dominant positivist mode of thinking.) Lawyers and legal scholars often miss what to me seemed obvious—that so many of our choices on whether and how to invoke, interpret, or apply international law entail moral choices with moral consequences. Several years ago, in the interdisciplinary journal International Theory, I examined the causes and consequences of this disconnect and offered some suggestions for future collaborative research. Over time, I decided to try to help fill the gap in global justice scholarship by offering my own assessment of the justice of international law. I sought out to inquire whether (and confirm a hunch that) the core norms of international law met a standard of justice deserving of the name—or in Rawls’ words, “the first virtue of social institutions.” That standard of justice could not, however, simply be plucked from Rawls’ theory for domestic society for two reasons. First, the international system is profoundly different from the domestic system: to name the most obvious ways, the state of nature has not quite been exited in that war is a constant reality or threat; the global system does not have the same attributes of a basic structure, including strong institutions, as does a domestic society; and an overlapping consensus is harder to achieve given differences across societies. Second, justice at the global level needs to concern not just distributive justice but a much broader set of questions about the duties of all global actors to one another. Justice must address questions like: Who gets a state? When can states go to war? Why should states have sovereign equality? Should some states get special rights in international organizations? Should states be allowed or required to protect human rights beyond their borders? The standard of justice I developed in the book and against which I sought to assess those core rules is based on two pillars, grounded mostly, but not entirely, in consequentialist morality—what I call the pillar of peace and pillar of human rights.  Second, I ask whether a rule interferes with basic human rights. This pillar reflects the view that peace should not come at any cost to individuals, and we do not want to endorse norms that would violate or lead to violations of those rights. I offer my own view of what constitutes a basic human right, but it is basically a practice-based concept limited to rights that states generally agree upon and are aimed at protecting individuals against the most serious threats to their integrity and welfare. By “interfere,” I have in mind a negative, consequentialist-based concept—to lead to a situation that reduces overall respect for those rights. If a norm interferes with basic human rights, it is presumptively unjust as well. (1) If a norm or proposed norm survives scrutiny under the first pillar by advancing peace, it is presumptively just. At that point, the second pillar is then considered, as we ask whether the norm interferes with basic human rights. The norm or proposed norm will survive scrutiny if it passes that test, but will be considered unjust if it does not. (2) If the latter, it will be necessary to explore alternatives that satisfy the second pillar but do so in a way that causes minimal disruption to the first pillar. (3) If, on the other hand, a norm fails under the first pillar by undermining peace, it is presumptively unjust; it can only be defensible if the norm is needed to create a state of affairs characterized by respect for human rights and even in that case must do so with minimal disruption to peace. These two pillars leave open many possibilities for the content of international law. For most norms or proposed norms, I argue one of two positions: (a) that my standard of global justice permits a particular norm, that is, that it passes scrutiny under the two pillars; or (b) that my standard of global justice prohibits a particular norm, i.e., that it does not pass the tests of the two pillars. I generally do not, nor need I, argue a third position, namely (c) that my standard requires a particular norm, i.e., that it passes scrutiny under the two pillars and no other rule would do so, although at times I will make such a claim. Certainly those engaged in ideal theory might wish to make such claims exclusively, endorsing only those rules that would do the best job of advancing peace without interfering with human rights. But the goal of my project is to appraise the norms we have, and I need not show that they are the only ones that meet the standard of justice. Moreover, these pillars do not represent a rigid formula where we identify exactly ab initio what constitutes peace or respect for human rights and then reach a binary conclusion that a particular norm is either just or unjust. I realize that consequentialist morality can be attacked for relying upon predictions about the future. But as an international lawyer, I see no alternative to judging the justice of most rules by examining the likely consequences when global actors act in accordance with those rules. At times, I consider how a deontological approach to the second pillar—asking whether a rule violates certain duties we have to all people—would affect our moral appraisal of a rule, but I leave it to the reader whether to adopt the consequentialist or deontological approach. Borrowing terminology from Walzer, I call this standard “thin global justice” to contrast it with the kind of justice expected of a domestic polity. But, as I said, it is a bona fide standard of justice all the same. My book reckons with competing standards of global justice, including one based on a deeper notion of “positive” peace, one focused exclusively on human rights (e.g., demanding that all norms advance respect for all human rights), or one calling for deep distribution of global wealth. I reject these for different reasons. For instance, it is not necessary for all of international law to positively advance all human rights since we have a distinct set of norms—human rights law—with precisely that function. More fundamentally, I believe most of the alternative standards do not properly grapple with the limitations of law in the international system. They might be fine for the ideal theory of some philosophers. But we can make more progress toward actually changing the world by engaging in non-ideal theory, working with the institutions we have or are realistically possible rather than just imagining new ones to fit our theories. Indeed, I think it’s somewhat irresponsible to propose alternatives to the existing order without taking account of whatever justice has been achieved so far in the rules states have developed (often after they rejected prior unjust norms) and even reckless to propose alternative rules that risk undermining that existing thin justice. And some key proposals by states and scholars to improve international law in one direction or another fall into that trap. As the book makes clear, my starting point in reality is hardly an endorsement of the status quo. I also do not see international law as the only institution available to promote global justice. Individuals and states can and should act in just ways through many non-legalized avenues.  The norms on the use of force met, indeed exceeded, the standard of thin justice. Article 2(4) and 51 are central to the preservation of interstate peace without interfering with, in fact usually advancing, the protection of human rights. Self-defense can be justly extended to cover attacks by non-state actors because of the threats they represent to both peace and human rights, although safeguards are needed to prevent abuses of self-defense by powerful states.  The norms on self-determination generally passed muster under the two pillars. The contrast between the clear right of colonial peoples to their own state and the strong presumption against secession from existing states balanced in an overall decent way the tremendous costs to interstate and internal peace from secession with the possibility that that remedy might be needed in cases of exceptional repression. I found cosmopolitan calls for rules more permissive of secessions unpersuasive for failing to treat the first pillar seriously enough. With respect to admission to and decision-making in international organizations, I emphasize the fairness of the process to applicants (an element distinct from justice), finding, for instance, the WTO’s policies lacking. As for decision-making, I defend the UN Charter’s allocation of authority to make legally binding decisions to a subgroup, that is, the Security Council. The special role for a group of permanent members also survives scrutiny, though the status quo of the current P5 does not. And the veto power of a small group of powerful states turns out to serve important functions for peace and contributes to the existence of the international legal system as a whole. Yet to the extent an unrestricted veto can prevent, and has prevented, the Council from responding strongly to human rights atrocities, it does not meet the test of the second pillar. In the case of humanitarian intervention without Security Council approval, the black-letter rule banning it is unjust for its interference with the protection of basic human rights. Yet state expectations actually conform better to a more context-dependent position that tolerates interventions in situations largely consistent with key criteria from just war theory. That position is just under the two pillars. In the case of both universal jurisdiction and humanitarian intervention, the law’s posture of permitting but not requiring states to act to protect rights beyond their borders generally reflects a balancing of the two pillars, although it does not fully respond to the claims of victims of atrocities. As for international trade law (where the second pillar is doing the heavy lifting), key norms like nondiscrimination can be interpreted to deny states policy space to protect economic and social rights. But some WTO decisions, such as the conflict diamond sanctioning scheme, also show the possibilities for trade law to pass muster under the second pillar. At the same time the Appellate Body has struck down some domestic schemes that might have been needed by the state to respect the right to health. Broader claims that the rules generally harm the human rights of those in the global south have to be parsed with great care. The picture is muddy enough to merit a provisional and cautious assessment of the thin justice of trade law. I conclude my study with a proposal for a thicker standard of global justice, one that is aspirational without crossing into the realm of ideal theory. It is a standard that judges the rules of international law by whether they advance human rights in a way that does not interfere with peace. We can then imagine what the core norms would need to look like in order to achieve this standard. But getting there must be done with some care. We must first reform those norms that do not meet even the standard of thin justice, in particular if they interfere with basic human rights. Then, we must make sure that, in improving the norms we have, we do not undercut their thin justice; that will typically mean ensuring that peace is not threatened by new norms. I hope that my book will contribute to the nascent conversation between international law and ethics, and that this joint EJILTalk-EIA symposium will contribute to that end. For international lawyers, ethics represents the next “international law and . . .”; and I hope that, for more philosophers, international law will prove inviting territory. We have much to gain by understanding and exchanging our perspectives, methodologies, and proposals for a better world.